The industrial development of any nation largely depends on its natural resources. Iron & Steel forms the backbone of many industries like automobile, power, transport construction / real estate and communication. In 1870, the unit at Kulti in West Bengal marked the beginning of modern steel industry in India. Establishment of steel plant in Jamshedpur by JRD Tata in 1907 set the tone for bigger production of steel from 1912 onwards. After independence, the steel industry growth was mainly dominated by public sector undertakings like Steel Authority of India (SAIL). Foreign collaborations were forged to bring in the technical expertise for such plants. Sandeep Sharma takes a look at the Indian iron & steel sector. Indian steel industry is likely to scale greater heights in times to come. The country’s growth story is likely to push more demand for steel from sectors like automobiles, real estate, infrastructure and transport. According to International Iron and Steel Institute (IISI) report, India is ranked as the seventh largest steel producer in the world. The Steel sector in India is a deregulated sector. The role of the Government is that of a facilitator providing a conducive policy environment. The Public Sector Undertakings (PSUs) namely Steel Authority of India Ltd (SAIL), Rashtriya Ispat Nigam Ltd (RINL) & NMDC Ltd are in the process of implementing significant expansion in the crude / finished steel capacities in their respective brownfield / greenfield locations. The Indian steel industry is growing at a fast pace, requiring additional quantities of coking coal. These resources are also being sourced abroad. The issues affecting the steel industry growth in India are mainly related to using obsolete technologies, lack of timely modernization, availability of inferior quality raw materials inefficient shop floor practices, lack of automation and control, lack of R&D intervention. As per Ministry of Steel report titled ‘A Roadmap for Research & Development and Technology for Indian Iron and Steel Industry’. The roadmap plans development of R&D projects at national level with participation from academic and research institutes/laboratories of repute as well as the industry to share expertise. The report envisages increase in R&D Investment from the present level of 0.15 to 0.25% of sales turnover to at-least 1% of total turnover by 2015-16 and 2% by 2020. As per provisional data released by Joint Plant Committee (JPC), the production for sale of total finished steel increased by 0.5% in February 2013 as compared to a growth of 4.3% (and not 8.7%) of February 2012. As per industry sources, the steel demand has grown at just 3.3% in 2012-13 to 73.34 million tonne. The dip in consumption growth is the lowest for at least three years. It grew by 5.5 per cent in 2011-12 over 2010-11 and 9.9 per cent in 2010- 11 over 2009-10, according to data compiled by Joint Plant Committee, a body under the Steel Ministry. The production of crude steel by SAIL and RINL has been 13.41 million tonne and 3.07 million tonne respectively during 2012-13. JSW Steel Ltd produced 9,91 lac tonne of crude steel in July. It reported growth of 47% from last year from its three manufacturing units at Vijayanagar, Salem and Dolvi. In the period under review, the company’s production of Rolled products: Flat was up 64% year on year while that of Rolled products: Long was up by 31%. As per Ministry of Steel, in the first quarter of the current year, the crude steel production is 19.61 MT. Tata Steel registered Hot Metal and Crude Steel production of 2.46 million tonne (up by 20% y-o-y) and 2.22 million tonne (up by 22% y-o-y) respectively for Q1 FY’14. Saleable Steel production was higher by 23% y-o-y (to 2.14 MT), and Sales increased by 26% y-o-y to 2.01 MT. In the CY2012, the prices of various grades of steel had fallen by 10-12%. The prices have subsequently increased by Rs 500-1,500 per tonne. The consumption is returning back to normal albeit at a slower pace. The price of flat steel is increasing slowly of late due to pick up in demand. Long steel used for infrastructure applications, is selling at a premium. The prices are holding strong and moving north on account of rise in input cost. Essar Steel India Ltd has recently raised steel prices by Rs.1,000-1,200 per tonne across most products. The increase in cost is attributed to factors like rupee devaluation, increase in prices of coking coal and gas prices. Last time in June, Essar Steel had raised the prices by Rs 500 a tonne. An Inter Ministerial Group (IMG) has been set up by the Government for effective coordination and to expedite implementation of various investment projects in the steel sector. Many of big ticket projects announced by POSCO, Arcelormittal are stucked in varied issues mainly land acquisition. To give a fillip to steel production, the import of critical raw materials such as coking coal, non-coking coal, scraps etc. are subject to zero or very low levels of customs duty. Duty on export of iron ore has been increased to 30 per cent so as to ensure iron ore availability for domestic production and value addition. The Company has produced 14.27 MT of Hot Metal in 2012-13 which has grown by 1% over the corresponding period in previous year. Total sales registered a growth of 2.8% in Q4 at 3.24 MT as compared to corresponding period of previous year. SAIL showed improvement in blast furnace productivity, energy consumption and coke rate of 5%, 3% and 1% respectively. Bhilai and Rourkela developed new grades of ASTM 537 plates which find application in pressure vessels for the petrochemicals industry. Bokaro Steel Plant came out with ultra high strength HR and CR steel especially for automobile industry. For the first time, Durgapur Steel Plant rolled out 31 CrV3 grade billets, a product highly sought after among makers of spanners and hand-tools. SAIL’s unit - Rourkela Steel Plant (RSP) has registered 2.5 per cent growth in the last fiscal over the corresponding period of the previous year and produced 23,65,824 tonne of hot metal. Similarly by making 22,07,282 tonnes of crude steel and 21,44,344 tonnes of saleable steel, RSP recorded improvement of 1.7 per cent and 3.09 per cent, respectively, over its production in the corresponding period of the previous year. RSP also realised more than 100 per cent capacity utilisation in all the three key production areas like hot metal, crude steel, and saleable steel. While at IISCO Steel Plants (ISP), a new Coke Oven Battery no. 11 and Sinter Plant have been operationalised and hot trials for the new Wire Rod Mill have also commenced. The JVC of MMTC and the Government of Orissa has achieved steel making capabilities after a long wait of ten years. The company had started production in 2002, but were only making pig iron. The company is equipped with a fully automated BOF and continuous casting plant. The company also intends to install a rolling mill. The revenue dipped to 5.8 per cent at Rs 13,650 crore in 2012-13 fiscal against Rs 14,450 crore clocked in previous fiscal. The dip was on account of subdued demand for steel. The production of finished steel grew by just at one per cent at 3.4 MT. Its captive power generation, however, reached the highest level in the last five years at 211 MW. NMDC Ltd produced 27.3 million tonne of iron ore during 2011-12, which is about 16% of the total iron ore production of 167.28 million tonne (provisional) in the country during 2011-12. During the year 2012-13, NMDC produced 27 million tonne of iron ore. NMDC is also taking steps to increase production of iron ore by opening up new iron ore mines and expanding the capacity of existing iron ore mines. NMDC Ltd is setting up a 3 million tonne per annum Greenfield Integrated Steel Plant at Nagarnar, Bastar District in Chhattisgarh at an estimated cost of Rs 15,525 crore. NMDC Ltd. has so far spent about Rs 1,819 crore for the project. Some of these projects have been delayed due to various reasons like unforeseen soil conditions, slow execution of work by contractors etc. Assocham had in March said exemption of iron ore imports from BCD and CVD was imperative to revive the “ailing steel industry”. Currently import of iron ore is exempt from CVD; the same attracts BCD of 2.5 per cent. Customer preference to buying steel has shifted to towards customized production as per specification. Now the customer doesn’t need raw steel. As per World Steel Association (WSA), the world crude steel production has been growing, albeit, at a lower rate since 2010. SAIL and KIOCL are likely to forge a JV to set up a 3 lakh TPA coke oven plant and a 25 MW power plant at an estimated investment of Rs 500 crore. This unit will come up at Mangalore in Karnataka. South Korean steel major Posco has initiated talks with Uttam Galva Steels to set up a three million-tonne per annum facility in Maharashtra with an estimated Rs 16,000 crore investment. Mesco Group firm - Mideast Integrated Steel Ltd aims to expand steelmaking capacity at Kalinganagar to 3.5 MTPA in next 5 years. This would require an investment of Rs 10,000 crore. In this regard, they have already started upgrading its pig iron making facility at Kalinganagar into a 1.2 MTPA fully integrated steel unit. Tata Steel is setting up a Greenfield steel plant with 6 MTPA capacity at Kalinganagar. This project is being implemented in two phases of 3 MT each involving an investment of over Rs 30,000 crore. The construction work is going on well. JSW Steel is coming up with 2.3-million tonne capacity plant at Bellary in Karnataka. 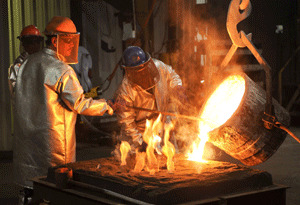 This unit would produce automobile-grade steel and is expected to commence production by December 2013. The National Steel Policy (NSP) was announced in November 2005. It’s a basic blueprint for the growth of a self-reliant and globally competitive steel sector. Ministry of Steel has decided to formulate a new National Steel Policy to replace the existing National Steel Policy, 2005. The process of formulation of new National Steel Policy is already on. The new National Steel Policy will formulate a new set of projections and policy guidelines for Indian steel sector. The Policy is proposed to address various issues like attracting investments in steel sector, technology and R&D initiatives, manpower requirement, raw material supply, infrastructure requirement, land acquisition, water etc. Indicative price inDelhi market inclusive of transportation, taxes & duties. The steel players have been operating in a challenging environment worldiwide faced with constant rise in input costs and lower capacity utilization. India still remains the focal area of consumption. With more than $1 trillion of investment in infrastructure planned in the current Five Year Plan the growth in steel production and consumption is likely to touch 1.2 times the GDP. It’s just a matter of economy picking up and sentiments turning favourable for infrastructure investment. The demand for steel is bound to rise. India continues to be the most promising market for steel in terms of consumption.